What does it mean to be middle class in America? Nearly a century ago, in Detroit — which was then the burning core of the country's middle class — the answer might have looked like a hot dog: a Detroit Coney, to be precise. 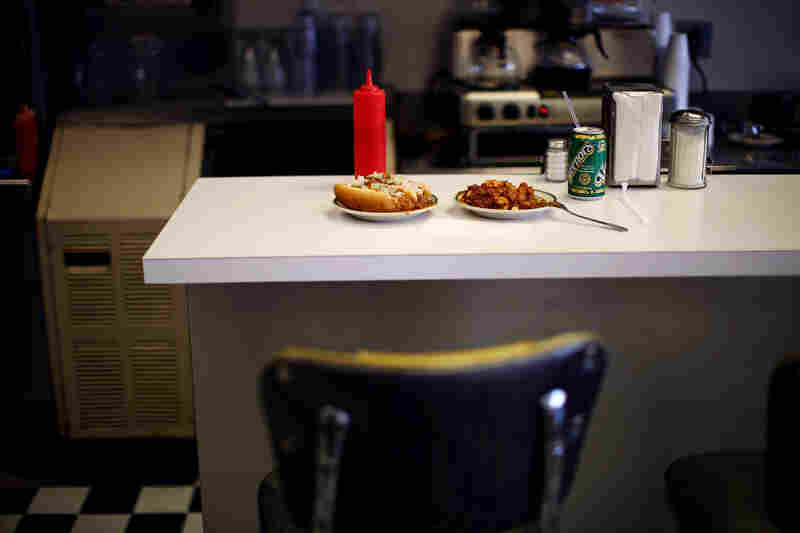 At its most basic, a Detroit Coney is a kind of chili dog — "a steamed bun, with a natural-casing hot dog, beef and pork," explains Joe Grimm, author of the book Coney Detroit. "And on top of that hot dog — which should be grilled, not boiled, not deep-fried — goes the sauce, the most important part." All along the streets of Detroit, you see big neon signs advertising Coneys — a word that refers not just to the hot dogs but to the hundreds of eateries that sell them. Eateries like Red Hots Coney Island, which has been serving up Coneys since 1921. Owner Rich Harlan has been working there for 48 years. He says his great-aunt and -uncle started the restaurant after immigrating to Michigan from Greece. "We are a block away from the first assembly plant that was made by Ford Motor Co.," Harlan says. "That's how they got started." Indeed, the story of how the Coney became Detroit's signature dish is deeply entwined with the history of the city's auto industry. In the 1920s and '30s, Detroit teemed with workers drawn there by Henry Ford's promise of a $5-a-day wage. "People came here from around the world to get that money," Grimm says. As a result, "the [city's] occupancy rate went over 100 percent." Housing became so tight that rooms were sometimes rented for eight-hour stints — long enough for one renter to sleep while another occupant was working a shift at the Ford factory, Grimm says.